Our eleventh annual Medieval Day Colloquium, titled “Time and Timelessness in the Middle Ages,” was held on Tuesday, March 29 in the Senate and Board Chamber, with support from the vice-president: Academic and the dean of Arts. The panel was chaired by Deborah McLatchy, vice-president: Academic. Following a coffee/tea break featuring our traditional medieval cookie, we had our first ever student poster session, which involved two exhibit re-design proposals by Erika Triggs (Medieval Studies/History) and Rachel Cogswell (Medieval Studies/Archeology). This was with reference to the Medieval Students’ Society field trip to Fort York last November to visit the Magna Carta exhibit. The audience was then entertained by a lovely musical interlude featuring renaissance lute music performed by Fiona Thistle (Music). The morning session concluded a with a presentation by our featured guest speaker for the colloquium: Richard Moll. A professor of English at Western University, Professor Moll received his MA and PhD in Medieval Studies at the University of Toronto. He is the author of Before Malory: Reading Arthur in later Medieval England (2003) and edited William Caxton’s translation of Ovid’s Metamorphoses: The Book of “Ovyde Named Metamorphose” (2013), as well as a number of articles. The recipient of a SSHRC Insight Grant (2012) for his research on “Vernacular Heraldry,” Moll has published a journal article in Medieval Studies titled, “‘Brutus the Emperor’: National and Heraldic Foundations in London, College of Arms MS, L6” (2013) and also has a book forthcoming on the subject from the Medieval Texts and Studies series of Liverpool University Press: A Heraldic Miscellany: Middle English Texts on Blazon and the Office of Arms. For his presentation at this year’s Medieval Day Colloquium, titled “The Heraldic Profession in Late Medieval England,” Moll explained some of the more interesting aspects of this curious profession and its own mythological genealogy. The audience responded with great appreciation, as Professor Moll’s talk elicited numerous questions and comments from students and faculty. After a lunch break, Nicholas Must (Medieval Studies/History) chaired the faculty research panel, with presentations by Christine Kralik (Medieval Studies), Eileen Kim (Medieval Studies), and Chris Nighman (History). For the final session of the day, the colloquium transferred to the Turret for a performance of the medieval morality play “Everyman,” the first production of the new Laurier Historical Theatre Society, which involved over 20 Laurier students, mostly from the Faculty of Arts and the Faculty of Music, including cast, crew, and musicians. Following the performance, which was well attended and very much enjoyed by the audience, the director of the play, Dylan McCorquodale (Medieval Studies/History), and Moll discussed the play itself and this production of it and responded to questions and comments from the audience. Finally, Laurier’s dean of Arts, Richard Nemesvari, offered concluding comments on the performance and on the entire colloquium, and thanked everyone involved in making this year’s colloquium a great success. 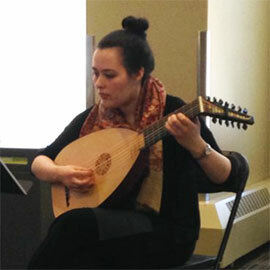 Once again, the Medieval Day Colloquium attracted a large and diverse audience comprised of Laurier undergraduate and graduate students, faculty and staff, and also members of the general public.